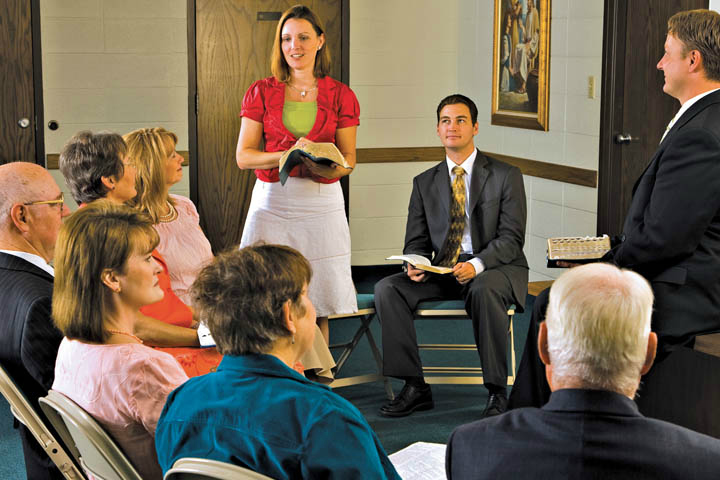 A topic that often comes up in online discussion groups among Mormons is the teaching manuals. As most of us know, these are written by the Curriculum Committee, overseen by the Correlation Committee. You can listen to a podcast describing the curriculum process here. Just reading the overview of it on that same page is very interesting. Lack of accuracy / white-washing. This is a bigger concern in the Gospel Doctrine manuals where some of the “traditional” information may now be known to be misleading or “optimistic” in its portrayal of facts, although a few Primary and youth speakers also noted misleading stories and examples in the teaching materials. Topics chosen are not Christ-centered. This is particularly of concern for teaching the Primary children and the youth who may be less familiar with the parables and stories of Jesus. Our kids seem to be pretty Biblically illiterate beyond some proof-texted memorization. Lessons are too repetitive. Particularly the new youth curriculum which focuses on a topic each month, and then that same topic is used for both the 2nd and 3rd hour. Gospel Doctrine is of course repetitive because we rotate the same 4 books of scripture every 4 years. The RS/PH curriculum that focuses on one of the modern day prophet’s teachings for a full year is another one with a lot of repetition, depending on which year. For example, Pres. Hunter was in office less than the year we spent using his material as lesson fodder. (However, that one was a pretty good one, IMO). Boring / not thought provoking / all milk and no meat. While it’s true that our lessons shouldn’t be a bear-baiting of controversial topics that have no real bearing on how to live a more Christian life in the coming week, when you are repeating the same materials as often as we are, offering some fresh perspective or interesting content is helpful. This is one place where the limits of correlation really shows (by contrast to manuals from earlier days). Some previous curricula were written by individual church historians and scholars (for some great examples, see this top 10 list); I’m partial to the O.C. Tanner manuals. The current crop of writers seem to be a dull lot. Maybe that’s because they are each individually unthinking dullards, but more likely the curricula is suffering from a widely known phenomenon: death by committee, the stifling effect bureaucracy has on the creative process. An individual author may create something interesting, fresh and thought-provoking, but a committee of authors will create mindless pablum that is inoffensive and innocuous, fit only to line bird cages . This phenomenon is well known in business. Now, before we get too far down this path, let me clarify that I’m sure plenty of the teachers and students are also unthinking dullards who would ruin even the best teaching manuals with their insipid and uninspired comments. Granted. And truth be told, a great teacher can make something out of even the most threadbare material. For example, I could listen to President Uchtdorf read a page out of the phone book, but that’s probably 90% the cool accent. I digress. Regardless the quality of teachers and students, let’s start with great materials. All boats rise with the tide, and the curriculum is the tide. I wrote to the curriculum committee once and asked why, on the Sunday before Christmas, we were discussing missionary work. Someone wrote back and said there was nothing preventing me from discussing Christmas in my family. I’m relieved to know that the Correlation Committee decided not to prevent people from discussing Christmas in their families. Whew! I was so embarrassed when we visited an evangelical church and the children came out of their children’s class telling me about the story of the loaves and fishes and they didn’t remember ever hearing it before! Now, I’m sure we could excuse this by saying that we have the FULLNESS of the gospel to teach, whereas all they have is Jesus. But let’s get the priorities straight here. Our kids don’t have the foundations yet; they are still just kids. The more we teach about Jesus, the better. If our kids are illiterate about Jesus, no wonder everyone says we aren’t Christians. Another Primary President noted that she is baffled that the curriculum was focused on tithing and modesty–for pre-pubescent children–while those same children were mostly unfamiliar with the stories of Jesus. Our priorities seem a little off track. If you want the curriculum to change, you’ve got to have a different group of people writing it. We can’t expect these folks to all of a sudden come up with historically accurate, deeply considered material. Didn’t the Savior say something about new wine in old wine skins? I don’t understand why the Brethren won’t change this model. It’s obviously not working. I’d love to see some honest to goodness Mormon theologians and historians come together to write new lessons. This sounds fantastic to me. In the attached podcast, the introductory note lays out the nine steps in the curriculum process and boasts that the materials are reviewed by hundreds of people before they are distributed. Hundreds! Well, I’m not some country bumpkin, impressed by the number of editors. Sometimes more is less, and this is one of those times. In addition to the creativity-strangling aspect of committees, there’s a psychological phenomenon known as bystander effect as well as a few other related psychological effects. The bystander effect, or bystander apathy, is a social psychological phenomenon in which individuals are less likely to offer help to a victim when other people are present. “Social loafing” basically means when people tend to spend less effort to achieve a goal when they’re working in a group. The greater the number of people who are involved with something the less any individual will feel responsible for the outcome. As a leader in business, it was certainly my experience that the more people who were asked to “sign off” on a document, the fewer who actually read it. I would often ask my peers if they had read such-and-such a document, and if we had all been asked to read it, most of them had not or had “skimmed it,” which usually means they read about the first paragraph and looked at any tables or charts, and then signed off. The clever ones might memorize a key phrase to demonstrate knowledge of the document to a superior if requested. If there was ever a problem, people would quickly point out that the document was X pages long, so maybe they had missed that one part. Yeah, right. Evaluation apprehension theory predicts that when we work in the presence of others, our concern over what they will think can enhance or impair our performance. We see the effects of evaluation apprehension in brainstorming sessions. In other words, nobody wants to be “that guy.” Everyone wants to move that paper along and sign it off and get it off their desk so they can get back to their other stuff. People don’t want to be the one cog that doesn’t move the paper through the machine. They don’t want to be the bottleneck. They don’t want others to see them as “different” or “outside group norms.” This can affect the quality of their feedback as well. While it may be “safer” to bring up a typo or a grammatical change, it might be “risky” to point out larger issues like the content or topics chosen or to point out that the traditional view of the material is not accurate or needs to be updated. Cultural norms prevail. Social facilitation, or the audience effect, is the tendency for people to perform differently when in the presence of others than when alone. Compared to their performance when alone, when in the presence of others, they tend to perform better on simple or well-rehearsed tasks and worse on complex or new ones. So the higher the number of reviewers, the worse the finished product. Nobody wants to be creative or point out a flaw others accepted or express a contrary opinion because that can cause backlash toward them or put them under scrutiny. In our highly authoritarian church culture, this is especially difficult for average people to do; if they have titles or credentials to back them up, they may feel more confident in dissenting, but most of our curriculum committee consists of average people who have taught seminary or other secondary education roles . Teaching and writing curriculum are not the same thing, and neither require any theological degrees or background in our church. Reviewers have the majority weight of the other reviewers to consider, as well as how their intervention will be perceived by others, peers in the process, as well as superiors. Audience inhibition might explain why people are reluctant to intervene in response to a potential emergency. People become concerned about other people negatively appraising their altruistic behaviour. Nobody wants to be pinpointed as the one who disagreed with everyone else. Standing alone is different when you are working with one other person than when you are working with 99 who are all fine with the status quo (but in reality probably haven’t even read the thing completely or may not have the skills or background to identify errors). So, back to the curriculum. Let’s hear from someone who has actually worked on the curriculum committee. Dan Peterson was interviewed by Dan Wotherspoon, transcript here, about his thoughts on curriculum, and it will sound pretty familiar if you’ve read this far. When he was extended the calling, he was told by Elder Lee that it was to improve the manuals, but when he tried to add context to the Old Testament manuals to help teachers, he was rebuked. Peterson: “I was never clear. I think it was Correlation, I think it was the Curriculum Committee. They would lay out certain things about the way they wanted us to do it. For example, we were doing the Old Testament one year and we wanted to put in some historical background. People can’t make sense of this if they don’t know what’s going on. I think a big aid to understanding Isaiah is to understand the politics of his day. Isaiah and Jeremiah were reacting to great power politics, and if you don’t know any of that, you can’t make any sense of it. A lot of it is talking about their day. We tried to put some of that in and we were rebuked by someone, some nameless bureaucrat up in Salt Lake who said, ‘you’re just trying to show off.’ I thought ‘How? We’re anonymous. Who would know? We’re just trying to help people out. Do you think the curriculum is getting better or worse over time? Defend your answer in the comments. How can we continually improve the curriculum to bring people closer to Christ? What’s lacking today, if anything, in your opinion. What would you do differently? Is the curriculum development process a positive or negative in your view? How much does curriculum improve the lessons compared to teacher skill? Is the mandate to avoid outside materials an overall positive or negative to the quality of lessons? I think I’m channeling Mark Twain. Again, based on those in online discussion forums who know people on the committee. One woman claims she did call the police, and 38 witnesses is an approximation based on the number of open windows in apartments overlooking the crime scene–not actual named witnesses in the police report. Previous Previous post: Do You Like the Baja Theory? Teaching in the church is a bit different from teaching in other contexts in that the Holy Ghost is the true teacher. As someone serving as a teacher, I feel my number one goal is to bring the Spirit into the classroom. Skilled teaching and anything else is merely a tool to get there. Being a Primary teacher for six or so years, I can’t relate much to the GD or RS lessons, sorry. But I do feel that the Primary curriculum is excellent. When I taught New Testament, we had a video almost every week thanks to the Church’s wonderful new Bible video series. And they are doing the same thing for the Book of Mormon. I think those multimedia presentations do stick in this generation of kids who are used to that format, so those are great tools provided. I also love that whenever Christ performs a miracle, we are always to point out that He never uses his priesthood power for his own benefit, but only to serve and help others, setting a model for how others should use priesthood in years to come. I also love the strong role of women this year in church history: The lesson on witnesses of the Book of Mormon included Mary Whitmer, the chapter on the publication of D & C included those courageous girls who braved the mob to rescue pages of the Book of Commandments. I am not sure about the restriction on outside sources. When I taught Isaiah in Gospel Doctrine, I used a version of the Bible that breaks the chiasmus into verses. It was the same version I used at BYU, so thought it was fine. I used powerpoint for that one. I also find a lot of General Conference talks that blow me away and work really well for the kids because of the audiovisuals. When we talked about the first bishop being called, we also talked about the modern-day presiding bishopric and what they do. I found a talk from Bishop Burton that had pictures of Mormon Helping Hands, humanitarian projects from all over the world. I felt the Spirit during that talk, I hope the kids did too, and the pictures and video clips perhaps kept their attention. But to me, it is all about keeping the Spirit in the classroom. I would note that when my daughter went to an Evangelical Church with her boyfriend, the pastor was impressed at how her knowledge of the scriptures was deeper than what the kids in his congregation had until he found out what church she belonged to. But I think that you have made some excellent points. “…the mandate to avoid outside materials…” was an early indication of changes being made in the RLDS 50 years ago, and I was primary age. 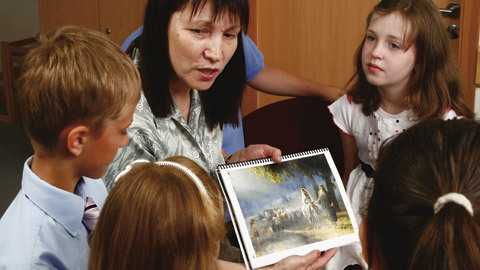 Curriculum moved from being church-produced to church-approved; and outside materials became available through the catalog. Eventually teachers were advised to use whatever they thought would hold the interest of their class. Many did go wild with their lessons, especially in the youth. Some were used to supplement, but not always. In one of my last years in the RLDS, an Adult Sunday-School class was on Family Ministry. The coursebook had to be purchased and attendance was required in order to receive credit. In our first class, the teacher handed out several sheets of material from outside sources to each student, and we spent the entire class time discussing them. The same thing happened the next Sunday, and the next. The coursebook was ignored. Finally I took to setting aside the stack of papers she would hand me and spend my time reading the lessons from the book. When she observed me doing this, she sarcastically remarked to the class that I was doing my own thing. That did it. I pointed out that the lesson book on family ministry was supposed to be the focus of the class; and while the outside material may be interesting to some, it wasn’t what I signed up for, or paid for. And since she had taught that we should be sensitive to other people’s needs, I remarked that I had previously stated my needs for the class, and she had mocked them. I stopped attending the class, but the teacher gave me credit anyway. I haven’t really been involved in teaching enough in my early time as a member to know whether the manuals are getting better or worse. I teach in our elder’s quorum and I have to say I rarely use anything from the manual. I try to have a conversation during the class in order to find out what the elders are struggling with regarding the lesson topic and we work together to try to come to some practical solutions. That sounds boring, but I find it’s a lot better than spitting out a bunch of quotes that are designed to convince the hearers to maintain the status quo at all costs. As far as improving the curriculum, I’d drop all of the stories that are apocryphal/untrue. I sat through the whole “warning about apostasy” lesson last Sunday and struggled to have my head not explode as I listened again to the likely untrue story of Thomas Marsh and the whole ridiculous cream skimming incident. I think the curriculum committee should begin with the idea that none of us really knows much of anything and that one way to create a vibrant and alive community is to encourage everyone to share their different views on a particular topic. That, of course, will never happen since the church clearly thinks that teaching and indoctrination are the same thing. Sadly, that means that anyone who has any questions, anyone who knows that a lot of the quotes are taken out of context, or anyone who knows that a lot of the stories are simply untrue will feel marginalized and excluded rather than included. And we’ve done this to ourselves. One reason for indoctrinating people, of course, is so that the people who are indoctrinated will help silence anyone who expresses doubt, curiosity or a desire to truly understand the complexities and contradictions of the church’s version of the gospel. And in my mind, the teacher’s skill is about 100 times more important than the lesson material. Having taught for 20 years and having observed many other people teaching, if you have a charismatic, engaged teacher, even if the material isn’t stellar, the class always ends up being better than having great material but a boring/unskillful teacher. Elvis Presley probably could not have explained the origins of the dorian mode and how it differs from the mixolydian mode, but he didn’t have to. He was Elvis and that was more than enough. Now, I’m sure we could excuse this by saying that we have the FULLNESS of the gospel to teach, whereas all they have is Jesus. Jesus *is* the fullness of the gospel. You’d be showing your age if you did. The BoM SS manual was published in 1999, OT in 2001, and NT and D&c in 2002. I brought this up in a stake SS meeting once and was told it didn’t matter since teachers all approach the material differently and when I asked one of the SP counselors, a CES instructor, about it he said that we weren’t “ready” for a new instructional program. As a side note Bro Peterson in the interview (I think) said that while kidding around they included a discussion question, “Has anyone ever suffered death by sacrament meeting?’ and it was missed by correlation in their first look. Bro Peterson spotted it in the galleys and called correlation before it went into the final manual. Great post! I agree with your points. Too often the lessons have no focus on becoming more Christlike and instead focus on inaccurate historical events that do not provide spiritual nourishment in a world-wide Church. I wish the Church would emphasize the life of Christ more and his attributes as the O.C. Tanner manual did years ago. Unfortunately, too many of our children are growing up without coming to know Christ because our lesson manuals do not focus on him as they should. Adults leave classes feeling frustrated that lessons take the focus from Christ to almost idolizing past prophets, which is wrong. Thank you for the post. I hope and pray that the correlation committee reads your post. I will have to remember this, and use it, the next time someone tells me that the 12 sit around and write this Pablum themselves, or that every page was translated directly from the Gold Plates. I also loved this, from GBSmith: while kidding around they included a discussion question, “Has anyone ever suffered death by sacrament meeting?’ and it was missed by correlation in their first look. Bro Peterson spotted it in the galleys and called correlation before it went into the final manual. He should have left it in. This post, well-written, well-researched, and erudite, pinpoints almost everything (including poor teaching, which has been exacerbated by what passes for “teacher development” in recent years) that irks me about SS/PH/RS, to say nothing of YW/YM, curricula. In fact, some of the newer initiatives are even more stultifying and rigid – I recently participated in the facilitator training for the 2017 Self-Reliance Initiative and was thoroughly discouraged by how it’s set up. Each session, which is billed as a conversation or discussion, is rigidly organized and timed. In the training, it was impressed upon us the importance of keeping to the script and schedule, as if the main life concern of people who were seeking to increase their self-sufficiency was that meetings ended on time. The sessions are carefully timed and scripted – there’s a group reading for each session activity, a short video, a group discussion (2-4 minutes! For an 8-10 person group! ), ponder time, etc. – lather, rinse, repeat. It was a thoroughly disheartening experience. I declined to participate as a facilitator. I wonder if the Church realizes that the current lack of meaty manuals is killing future generations. Exhibit A: my children who each week spend the entire 15 minute ride home from church complaining about how boring their classes were. I get the whole milk before meat concept, but eventually we have to graduate from milk to something more substantial, lest we perish from spiritual malnutrition. 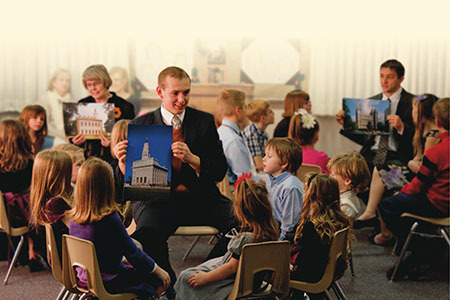 The church is trying to improve teaching by the new monthly program and in some places I’m sure it will help. I’ve been in classes where the lesson was followed and given the skill of the teacher, everything went fine but then at other times, not so good. I wouldn’t hazard a guess on what percent is lesson and what is teacher but to me a good teacher can make something out of next to nothing. Limiting use of outside materials is interesting because teachers do it anyway and most of the time nobody cares if there’s been a good discussion and they learned something. Anyway, I think the plan for now is to leave the lessons as they are and try and make better teachers. We’ll see. This post represents exactly how I feel. Along the same vein, I can’t get over how unhelpful I have found the new Bible videos to be. I was just looking for one tonight to accompany our family’s New Testament study and they are just so mediocre…the acting, the affectation, even the inaccuracy. There’s nothing to learn from them — they dress people up and start the music early and strong in an effort to conjure up some emotional draw. It’s form without substance and so frustrating. If only we could put a little more insight and preparation into things like that it could be such a fantastic resource.